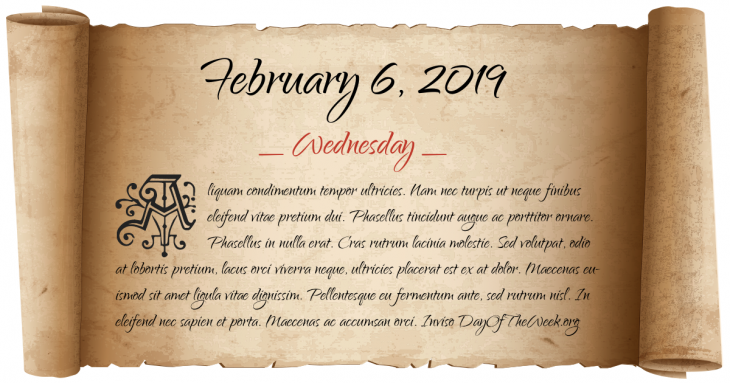 What Day Of The Week Was February 6? Battle of San Domingo British naval victory against the French in the Caribbean. New Year’s Day in Chinese calendar. Start of the year of the Water Ox in Chinese astrology. The Washington Naval Treaty is signed in Washington, D.C., limiting the naval armaments of United States, Britain, Japan, France, and Italy. The Blizzard of 1978, one of the worst Nor'easters in New England history, hit the region, with sustained winds of 65 mph and snowfall of 4\" an hour. The National Resistance Army of Uganda launches an attack on a Ugandan Army installation in the central Mubende District to begin the Ugandan Bush War. Willamette Valley Flood of 1996: Floods in the Willamette Valley of Oregon, United States, causes over US$500 million in property damage throughout the Pacific Northwest. Who were born on February 6?